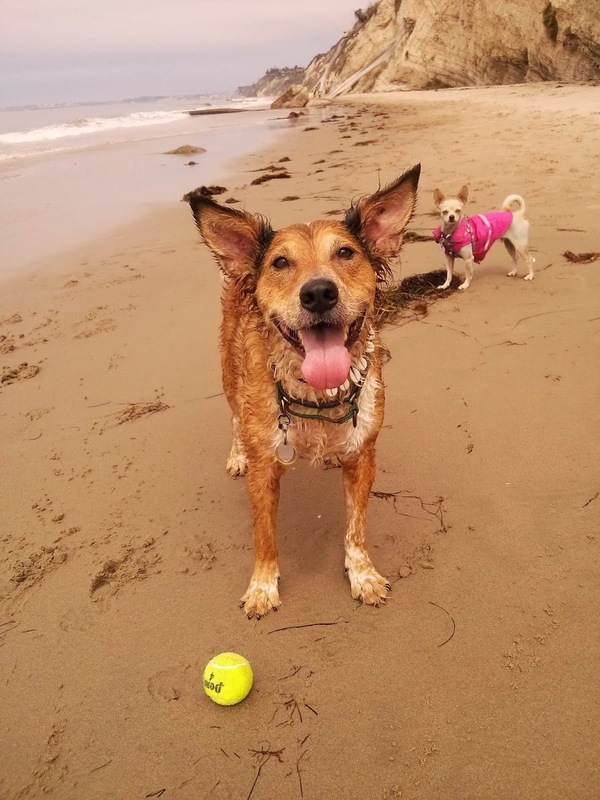 Zymox, owned by Pet King Brands, markets enzyme-based health products for veterinarians to sell to their clients. Their offerings include ear cleaners, oral care products, and various skin treatments. Our vet recommends Zymox Enzymatic Rinse when Brisbane has major skin issues. The rinse can be used along with a number of different shampoos, and can be rinsed or left on. The whole point of the Zymox products is that they use a proprietary LP3 enzyme system against microbial organisms. The company's FAQ page cites several peer-reviewed articles published in the International Journal of Applied Research in Veterinary Medicine. I was extremely impressed with this until I read the entire citation and realized that every single paper was about an in vitro study. This *basically means they proved that their enzymes kill bacteria and other nasties in a petrie dish. Since these are topical products, in vitro studies are very promising. However, I would like to see some controlled double-blind studies demonstrating actual clinical efficacy because I am a science geek. We've been through several bottles of this stuff, and I love the way it smells. I hate the way coconut tastes, but the scent is lovely when I'm smearing it on my dog. Zymox Enzymatic Rinse can be used diluted or full-strength, and can be rinsed off or left on without causing problems. When Brisbane is just a bit itchy, I dilute it and rinse it off a bit but not very thoroughly. After the dramatic shavedown, I slathered on the full-strength product, put on his bathrobe, and sent him off to spread the coconut-scented love. It left him feeling slightly dirty for a bit, but once dry his coat felt normal. Zymox stuff is apparently effective against fungus as well as bacteria, and along with a medicated shampoo helped Brisbane beat his massive bacterial and fungal infection. My vet is a skeptic and sticks to science-based medicine, so I trust her recommendation as more than an attempt to sell a product. It seems to have worked for us, though I'm not sure how much of that to attribute to the Zymox Conditioning Rinse and how much to the medicated shampoo we used. Tonight I'll be snuggling with Brisbane, Sisci, Ru, and also Ranger and Annie who have come to escape their neighbor's scary fireworks. In 2016 I'm hoping for fewer skin issue for Brisbane now that we've begun allergy shots and identified more food sensitivities. I'm not sure what else the year will bring, as we had a followup on Brisbane's face bump today. Two weeks of abscess-targeting antibiotics did nothing at all, so today our vet took three different needle biopsies and sent them to the cytology lab. I'm hoping to get results on Monday, and we'll decide what to do from there. Sniffing is just how dogs check out smells, right? Well that's part of it, but there's actually quite a lot more going on when your dog has their nose to the ground. They may be collecting information, but they could also be trying to calm themselves, reassure someone, or diffuse an escalating social situation. There's a time and a place for getting our noses up off the ground, but I think it's worthwhile to ponder what's really going on for a moment. I like to think of sniffing as a dog's personal "me time", their chance to withdraw into their own head for a little while. As a major introvert, I definitely understand needing that chance to pull back and recharge. When I need to take a break from the world, I like to read a book. When Brisbane needs to take a break from the world, he sniffs the ground. This took me a lot of years to learn, and for a long time I thought Briz was just getting distracted. Obviously he thought the smells on the ground were just more interesting than me, and I needed to work harder at being the most exciting thing in the world to my dog. This was endlessly frustrating while we were doing UKC obedience trials because mine seemed to be the only dog who couldn't keep his nose off the ground. At practice I would ask for attention and feed him treats constantly, but the instant he had the treat in his mouth his nose would drop to the ground again. 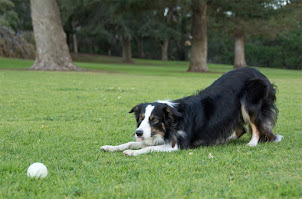 All the other dogs could calmly sit or lay down in between exercises, mine was constantly, endlessly searching the grass. It wasn't until I had quit formal obedience that I read Control Unleashed and realized Brisbane found the whole sport to be incredibly stressful. Dogs use sniffing as a calming signal, a way to help themselves relax or tell another dog that they are not a threat. However, some dogs don't know how to use sniffing to help them unwind. I've been working with a young poodle mix who is generally anxious about the world around her. She responds to alarming sights and sounds by freezing in place. She's not particularly motivated by food, but absolutely loves praise. 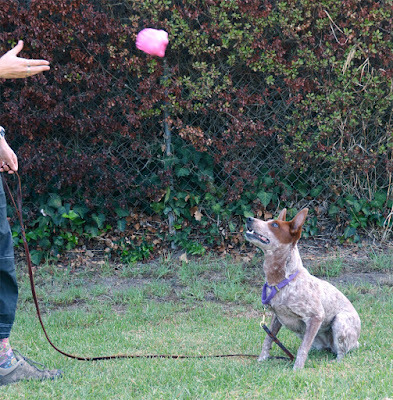 At our last training session, her handler and I just stood with her for a while in the middle of a grassy park. We all watched some children playing at a playground at the far end, and waited for the pup to do something other than freeze and stare in horror. After almost ten minutes she dropped her nose to the ground and we told her what a magnificent dog she was for having a sniff. This immediately led to more sniffing. After another amble around the park, we walked toward the playground again. This time we got much closer to the kids before she froze. A moment later she began sniffing the grass, and we speedwalked away from the playground and declared it a victory for the day. Of course, not every sniff is an attempt to relieve stress, especially if you have a beagle or other scenthound. The world is a big, exciting place full of amazing scents that we humans will never truly understand. Some dogs do indeed need to learn to get their noses off the ground and focus on their handlers, but I think intense sniffing should be a part of most adventures. As a devout bookworm, I like to think of sniffing as reading with their noses. If my happily engaged dog suddenly abandons me to delve into a book, it's either a really good novel or there's something he needs to escape from. 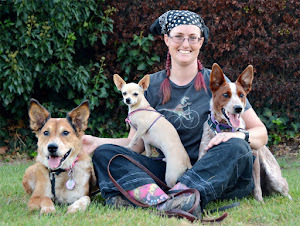 Ranger and Annie are our part-time dogs. They come to visit and herd sheep and hike and join us on our adventures periodically. Ranger was my first foster dog nine years ago, and Annie is his little sister that their family adopted a year later. 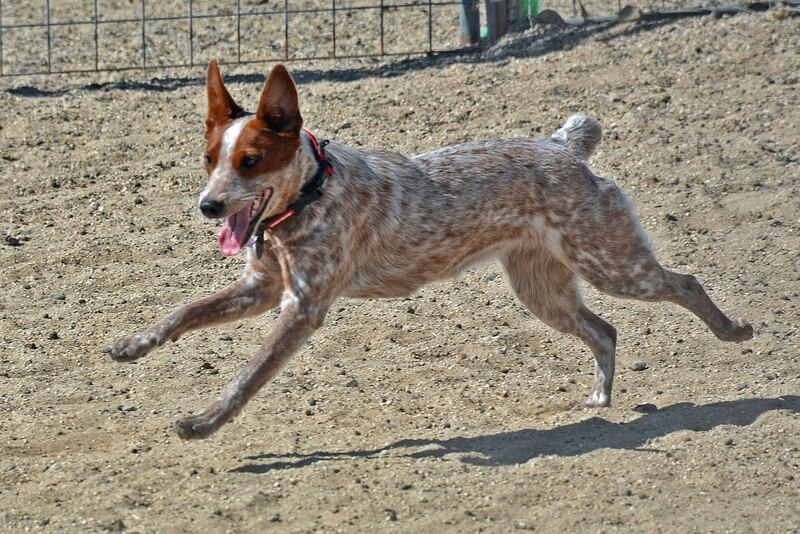 I'm pretty sure Ranger is actually an Australian Stumpy Tail Cattle Dog based on the shape of his head and his coloring. As adult rescue dogs, Ranger and Annie both tend to take treats roughly. Taking treats gently can be a difficult skill to learn as an adult, and is something that needs to be reinforced perpetually. 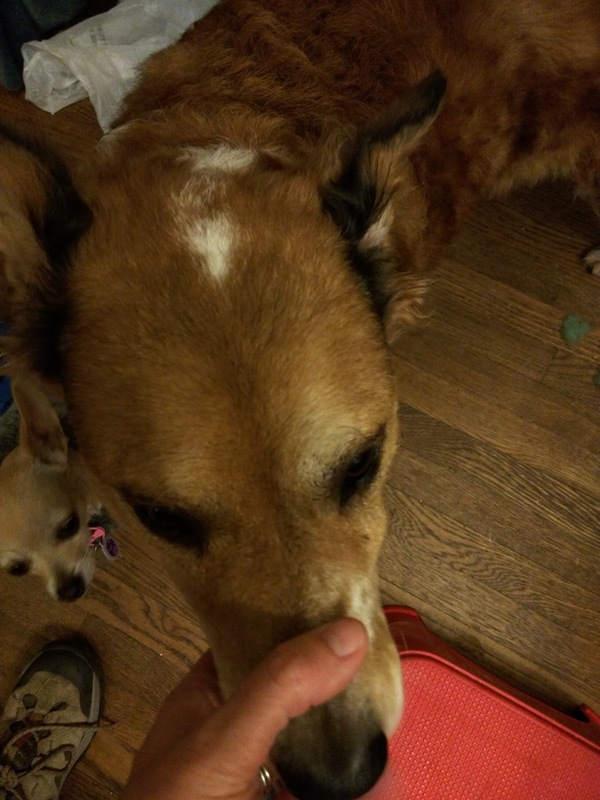 Ranger is eleven years old, and Annie is nine, so I'm not expecting to undo a lifetime of finger-chomping. There are a number of ways to give treats to a dog that doesn't mind grabbing a finger or two. One way is to use soft, lickable treats like peanut butter, spray cheese, or LeanLix. Another way to save your fingers is to toss treats instead of handing them. I do this with Ranger and Annie when I want to reward them very quickly, but it has the side effect of reinforcing treat chomping. Tossing treats also doesn't work very well when attempting to teach a new trick using a food lure. Essentially, I need a way to hold food while my hand is in range of their jaws. I took classes at a teaching zoo years ago, and one of the things I learned was to give food rewards by shoving my entire hand in the animal's mouth. 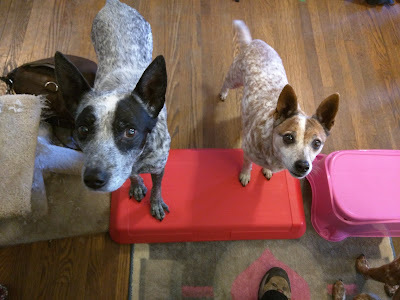 This works surprisingly well, much better than timidly offering a treat that they could just as easily knock out of my hand as they reach for it. With time and repetition, the animal learns to wait for the food to come to them, rather than rushing toward me to get it. 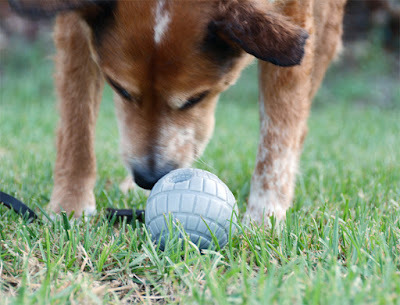 These Boundless Long-Lasting Chews by Dogswell are shaped like infinity symbols. That's why I couldn't resist giving them a try. In case anyone was wondering, they don't last an infinitely long time. I found them at my local Petco, and the Dogswell website oddly does not mention them at all. In fact, there's almost no mention of them whatsoever on the internet as of December 2015. Why is that? According to the Dogswell Facebook, "Boundless Long Lasting Chews are actually a new product and as of now are only being sold in Petco stores." Apparently they aren't particularly being advertised or promoted, either. Maybe they're only available in certain test markets? At my local Petco, Dogswell Boundless chews come in two sizes, for medium and large dogs. They are made in the USA, but some of the ingredients may be imported. The ones I bought were medium, for 21-50 lb dogs, and they were $5.99 each. They were available in two flavors, chicken and bacon. Shockingly, the bacon flavor is safe for Brisbane's many food allergies. It contains no poultry products, no egg products, no corn, no barley, and no sweet potato. Amazing! Boundless chews are made out of potato, tapioca, glycerin, peas, milk, bacon fat, sunflower oil, and some vitamins. The fine print on the packaging says this chew is not suitable for dogs under 10 lbs. I noticed this after the fact, but Ru ate a 2" piece of Sisci's infinity chew and lived to tell the tale. Good For: Lasting about as long as a bully stick of similar size while being totally non-stinky. Dogs with beef, poultry, egg, grain, or sweet potato allergies. Not Good For: Lasting longer than a bully stick of similar size. dogs with potato, tapioca, pea, or bacon allergies. How Much We Like Them: Brisbane finished his in about 15 minutes flat. Sisci took almost an hour on the project and Ru managed to steal the last bit when she was momentarily distracted. I will probably buy these again as an occasional treat, mostly because I like the shape. If they were a couple of dollars cheaper I'd totally stock up. The ZenPet ProCollar is an inflatable alternative to the traditional big plastic lampshade collar for dogs that have just had surgery or otherwise need to be prevented from chewing or scratching themselves. 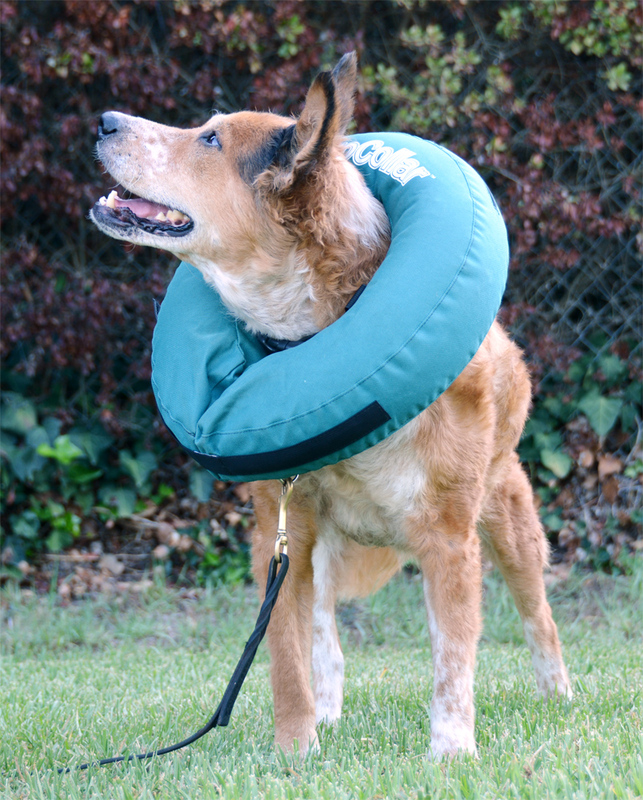 The inflatable core is surrounded by a washable cover that attaches to a regular quick-release buckle collar. Replacement for the inflatable part are available from ZenPet. 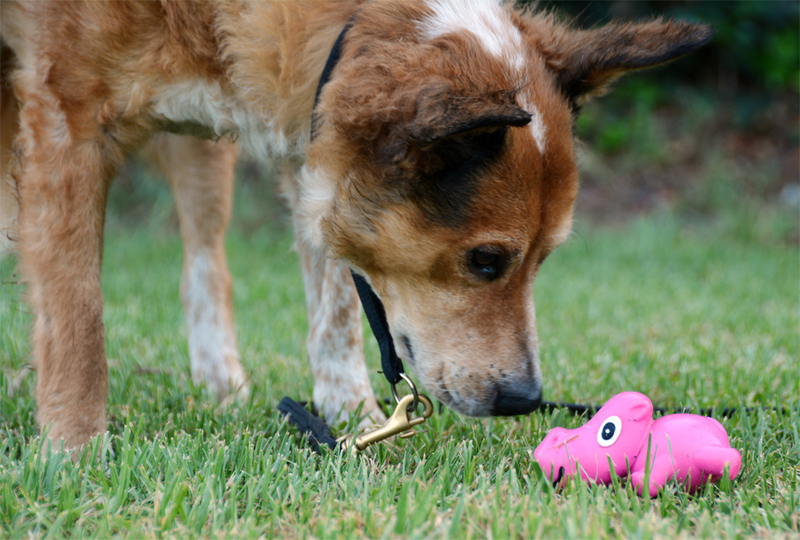 The ProCollar is available in size sizes to fit pets with necks smaller than 6" and up to 22" around. Our Procollar is a size large, for 13-18" necks. Brisbane has about a 16" neck and the collar looks and feels a bit big on him. I bought it when we did the dramatic shavedown and I was worried about Briz chewing up his delicate naked skin. We didn't end up needing the inflatable donut collar, but I did lend it to a friend for her dog. Penny is just about the same size and Brisbane, and she had to have a back toe amputated. Unfortunately, Penny had no trouble at all chewing her bandages off while Wearing the ProCollar. I've had dogs come into daycare wearing ProCollars and have had similar experiences. For some dogs it's a big enough deterrent to keep them from chewing their bodies or scratching their faces, but most figure out how to work around it before long. ZenPet says to try the next size up for the dogs that work around it, but I'm sure there's a limit to how much bigger a collar you can use before you can't make it work right. The ProCollar is a C-shape that opens up, and closes with a long strip of velcro. On the inner edge there are loops through which the dog's regular buckle collar is passed. 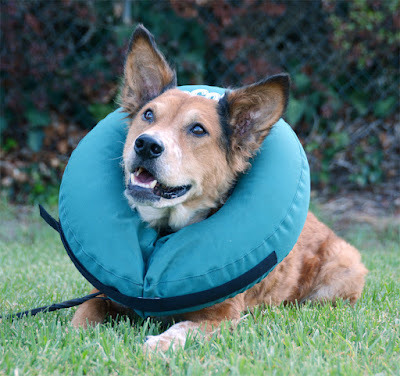 The regular collar is then buckled around the dog's neck and the velcro fastened to keep the ProCollar shut. On a donut several sizes larger than the recommended size, the regular collar will not be able to pass through all the loops to keep it on securely. Pros: Comfortable for extended wear. Does not trap moisture against a drooly dog's chin and neck. Does not obstruct vision. Does not alter hearing or make everything sound weird. Does not make you curse wildly when an over-exuberant dog smashes it into your knees. Washable. Cons: Is not as effective as a giant plastic Elizabethan collar. Unlike the Cone of Shame, many dogs can bend around it, making chewing their feet or tails pretty easy still. It's inflatable so it can pop. Bottom Line: Part Cone of Shame, part air mattress for your dog's neck. This will probably work on Brisbane because he is easily deterred from hurting himself. So far all the determined dogs I've used them on have just gotten more flexible and/or creative. We went to see our favorite vet today, and she poked around at Brisbane's face and said the bump was very likely a tooth abscess. However, she couldn't rule out cancer without tests. She decided that the most cost-effective test would be a two-week course of a type of antibiotics that target abscesses well. From there, one of three things will happen. Brisbane and Sisci hunting gophers, just because. 1. The bump will go away for good. If this happens we will know it was an abscess that resolved with conservative treatment. 2. The bump will go away temporarily, and then come back. If this happens, we will know it is a dental abscess that did not resolve with conservative treatment, and Brisbane will need a full round of x-rays and a tooth extraction. 3. The bump will stay the same. If this happens, we will know that the bump is not an abscess and can begin doing biopsies to figure out what exactly it is and how to treat it, without having spent a ton of money on unnecessary dental care. So now we wait and see what happens. Ideally the bump will go away forever, but I think we can handle a dental extraction if necessary. Brisbane has lovely clean teeth, but I guess sometimes the roots of a tooth can just go bad. Brisbane has a big bump on his cheek, and it's probably an abscessed tooth. Poor Briz! At first I was worried it could be cancer, but several of my internet friends have suggested that it looks like an abscessed carnassial tooth. Those are the biggest back teeth in the upper jaw. Of course we're going to the vet later today. I noticed the bump on Friday night, when all veterinary issues arise around here, but Brisbane's doctor doesn't think this is an emergency situation so we're waiting for an available appointment. The bump on Brisbane's face is very hard, it feels just like the other side of his face except for the shape. It doesn't feel warm to the touch, and he doesn't mind me poking at it so it doesn't seem to be causing him pain. He is still gnawing bully sticks happily on both sides of his mouth and basically acts like he is fine. The bump has actually been there for about two weeks, but it has been slowly growing and wasn't big enough for me to really identify it as a problem until Friday. I didn't think it was an abscess at first because it isn't hot or painful. Brisbane actually has beautiful clean teeth, another reason I didn't suspect an abscess. According to my vet, the probable-abscess is an urgent problem, but not an actual emergency. As long as Brisbane is eating normally, drinking normally, and breathing normally, he can wait a few days for an appointment with his regular vet. Given his various health issues, I'm comfortable waiting to see the doctor who knows him best. I did call the clinic that did Ru's dental a few months ago, but they were unable to see Briz before today either. Is that an eye-catching title or what? It's true though, and worth catching eyes for. 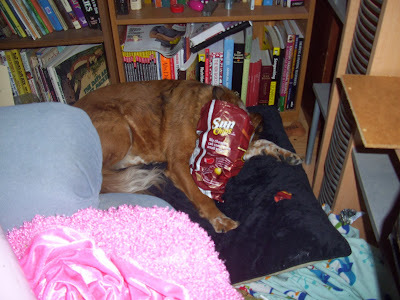 Last spring I posted a picture of Brisbane with his head in an empty SunChips bag. For most people, it's just a cute picture. For some, it is downright horrific. You see, a dog can suffocate in a chip bag. I had actually heard of this happening before, in a news article some years before I got Brisbane. For this reason I've always kept an eye on him when he has something he could suffocate in. The reason I was able to take this picture was because I was monitoring his chip bag enjoyment. My dogs go for shredding stuff rather than burrowing their noses into bags normally, so I hope that reduces their risk of undignified death somewhat. Still, I will be reconsidering what I give them to shred after visiting the Prevent Pet Suffocation Facebook page. Aside from keeping the garbage locked up tight and assuming your pets will happily suffocate themselves in anything that once contained food, there's a simple thing you can do to help prevent this kind of tragedy. All you have to do is cut or rip the sides of your food bags open before you toss them. A chip bag with the sides open is just a strip of plastic or foil. Not nearly as dangerous. PetzLife Oral Care Gel is a product designed to break down tartar without the need for brushing. It is made from grapefruit seed extract, grape seed extract, peppermint oil, neem oil, and thyme oil. The product is peppermint-flavored and intended to be applied twice a day to break down nasty tooth crud. My dogs have pretty clean teeth, mostly thanks to raw bones. Ru did need a veterinary dental earlier this year because of his super-crooked tiny incisors, but despite being rotten the teeth were still quite clean. Brisbane's look amazing for a ten year old dog, and Sisci's haven't had the chance to develop any tartar yet. 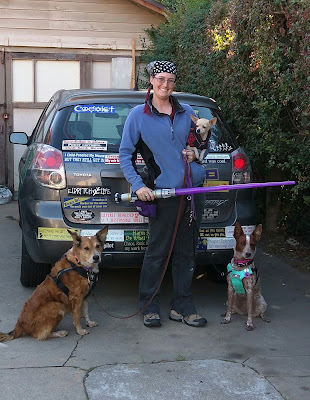 I brush Ru's teeth every night with a Sonicare electric toothbrush because chihuahuas have notoriously bad teeth. Also because he is tiny and easy to hold down. The cattledogs are pretty leery of the noisy toothbrush, but I still rub some enzymatic toothpaste on their teeth every day or so. They also happily chew raw bones of all sorts, which does wonders for their teeth. I bought this bottle of PetzLife ORal Care Gel on the recommendation of several of my internet friends. Several of them had tried it and reported that they could brush or scrape the discoloration off their dogs' teeth with their fingernails within a few weeks of using PetzLife. The product website has lots of before and after pictures of fairly yucky-looking dog mouths that do look improved, sometimes after only two weeks. My thought is that I don't really have anything to lose here. If the product doesn't work at all, nothing will happen. It says it can be used by humans and I haven't found any online reviews about sick pets. If it does work, my dogs will have yet another thing to help keep their mouths healthy. Though I've had the bottle for a few months now, I haven't used it consistently because my dogs hate it. I think it's the taste, the stuff is super minty and has a bit of alcohol in the base so I'm sure it tastes vile. 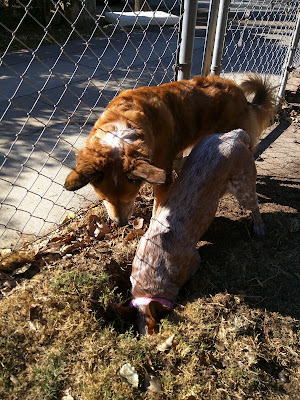 If the cattledogs see me pick up the bottle they hide, so I have to sneak up on them. I keep it by the door so I can use it on them right before when leave the house, after I've put on their leashes so they can no longer escape. My dogs all have pretty darned clean teeth, but the cats are another story. James and Solstice, my seven-year-old littermate cats, have lovely white fangs. I thought this meant they had clean teeth until this evening when it occurred to me to pry their whiskery faces open and look at their molars. They both have pretty big hunks of tartar on their back teeth, and their gums are a bit red. I smeared some PetzLife gel on their teeth, which they both hated. Fortunately my cats are unbelievably stupid, so they are unlikely to catch on and should be easy to test the PetzLife gel on. I just started this evening, and I will report back if and when I notice any changes. 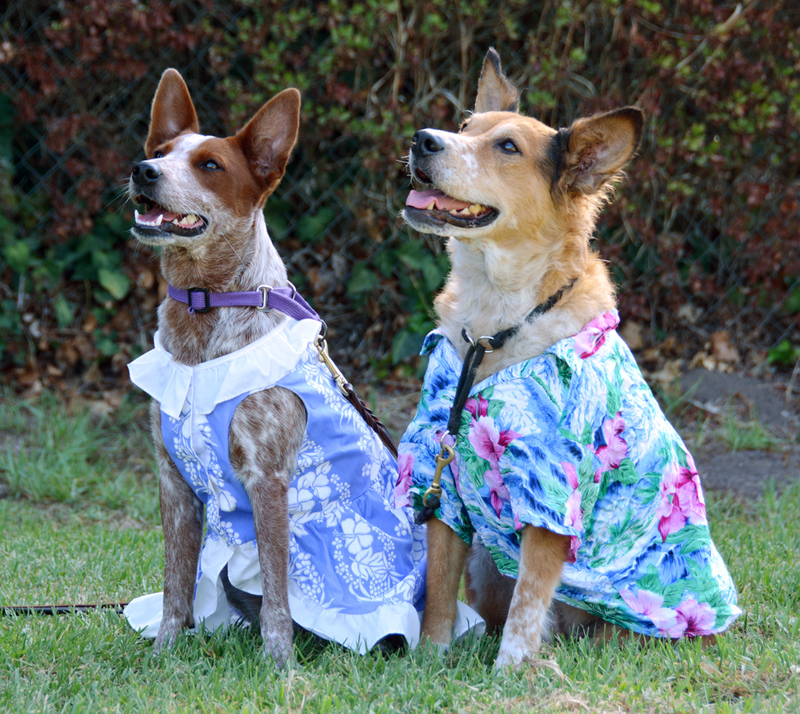 At the end of October, Brisbane and Sisci and I went to a two-day AKC lure coursing event. Brisbane did a total of four runs, two per day, and each was a qualifying run. This brought him up to ten AKC Coursing Ability Test runs, earning his Coursing Ability Advanced title. Go Brisbane! A friend recorded one of his runs for me. Coursing Ability Tests are usually set up with two different courses, a longer one that most of the dogs run, and a shorter one for tiny, smush-faced, and older dogs. At ten years old, Brisbane is allowed to run the short course. He is willing and able to run the longer one, but keeping him in shape is difficult and he's not as fit as I'd like him to be. Usually I ask the judge which they'd like him to do, and so his first run was on the longer track. They both start out in the same place going the same direction, but the longer one turns to the right and the shorter one to the left. Brisbane likes to anticipate where the lure will go so he can get ahead of it. On this run, he expected it to turn right, so he runs the wrong direction briefly. Sisci was three weeks short of her first birthday for this event, so she was not eligible to enter. However, they did do fun runs. These are not counted or recorded, and are a nice way to let puppies and unregistered dogs participate. Fun runs are also an inexpensive way to try out lure coursing if the dog has never done it before, and the handler isn't sure if they want to play. Sisci definitely wants to play. After her run, everyone wanted to know why Sisci wasn't entered. The AKC requires all dogs participating in a Coursing Ability Test to be at least a year old. Sisci is now old enough to officially do AKC CATs, and I'm sure every run she does will be a qualifying run just like Brisbane's. 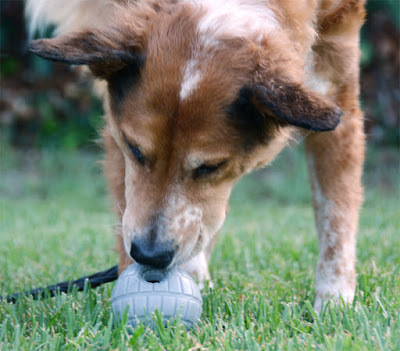 Hi-Tek Naturals is a line of dog food by Hi-Tek Rations. There are a couple of grain-free formulas in the product line, but most contain barley or rice. They also contain eggs, which is why I didn't end up feeding this grain-free Alaskan Fish Formula sample to Brisbane. It had been sitting on my counter for quite some time before I finally got around to feeding it to Sisci. Hi-Tek appears to be a private company with their own manufacturing facility in Dublin, Georgia. I haven't been able to figure out what other brands they manufacture, but it appears they may be a co packer for other food companies. There do not appear to have ever been any recalls by this company, which is quite nice. 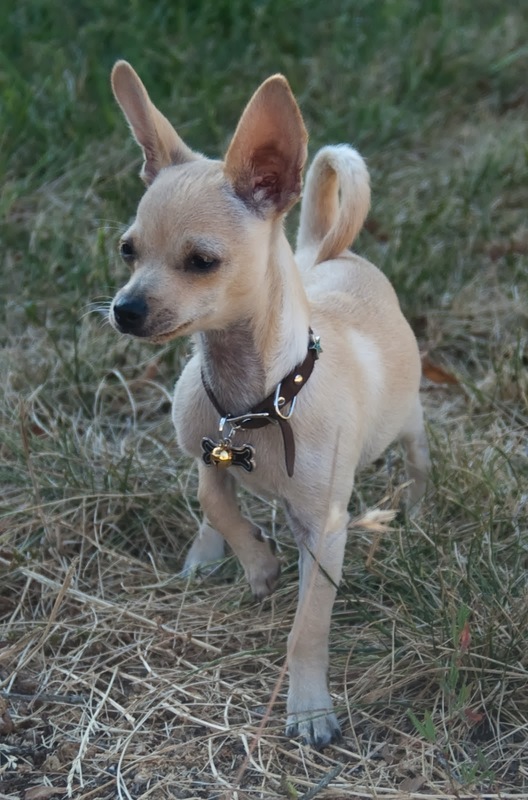 The grain-free Hi-Tek Naturals formulas rate five out of five stars on Dog Food Advisor. The first ingredient in the fish formula is salmon meal, followed by sweet potato, herring meal, ocean whitefish meal, and then potato and peas. Eggs are pretty far down the list, after canola oil, ground sage, ground basil, and tapioca. Still, I didn't feel comfortable feeding this to Brisbane due to his egg sensitivity. Then I got back his allergy test results and it turns out he's allergic to sweet potatoes too. At 373 calories per cup, this food is sort of in the middle of the range of caloric values. It is an adult maintenance diet, not for growing puppies. Dog Food Advisor identifies it as a plant-based dog food, but one containing a below-average amount of carbohydrates and an above-average amount of protein and fat. Interestingly, there is only one Hi-Tek Naturals food suitable for puppies. The rest are all adult maintenance foods, including all three grain-free formulas. Briz couldn't eat it, but Sisci and Ru both enjoyed this food quite a bit. This is not something I would currently choose to feed Sisci long-term because I'm still feeding her like a growing puppy, or possibly an athlete. Adult maintenance formulas often have less protein and fat, though the levels in this food are well above the minimum standards for both adult and puppy foods. One of my local stores recently began carrying Hi-Tek Naturals, but the company doesn't make a single food suitable for Brisbane's poultry, egg, corn, barley, and sweet potato allergies so we won't be adding this to our rotation. This Star Wars puzzle ball is shaped like the Death Star, and it's so awesome I can barely stand it. That's no ball, that's a space station! I find most of Petco's Star Wars merchandise to be sort of pedestrian and blah, but this...this is art. The big hole (where the giant laser of death comes out) has a rim around the inside that makes it easy to pop kibble inside, and difficult for the food to fall out again. Instead, the food has to come out the smaller hole at the bottom. The top has an even larger holes covered by triangular flaps, through which a chew stick or long biscuit can be partially inerted. So many options! I just checked, and I can jam exactly 3/4 a cup of PureVita kibble into this thing. It's enough to feed a small meal. One kibble at a time, the big hole is too small for a soda bottle funnel. It's really tough to get that last kibble out, and most of the time when I find this ball around the house, there's still a piece or two left in there. It drops the food at just the right rate to keep Brisbane interested, without dumping the entire load at once. Bigger than a tennis ball, so big enough for a fairly large dog to enjoy, just not a giant breed. Light enough for a tiny dog, too. It won't stand up to a power chewer on a mission of destruction, but anything less is unlikely to hurt it. Soft rubber rolls silently across my hard floors. Fits under the couch and rolls freely, the only reason I can usually find it is because the dogs enjoy carrying it around. I can shove a bottle brush in there, but it would be tough to scrub most of the inside of this ball. 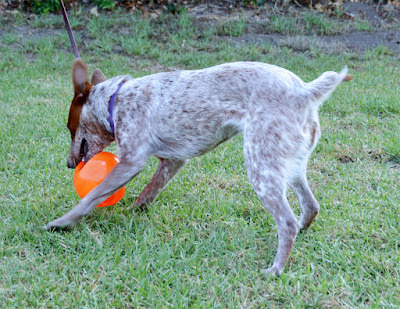 The difficulty in cleaning limits what sorts of treats can be put inside, and what animals can use this ball. It's a nice size though, and has a lot of potential. The Evertuff Squeaky Barbell by JW Pet is a durable nylon chew toy with a soft squeaky toy inside. It is available in several colors and two sizes, medium and large. I believe ours is a medium. This somewhat awkward toy arrived in our September BarkBox. It's a hard nylon toy with one squeaky end, and I thought it was pretty heavy and unappealing. Sisci's mission is to play with All The Toys, so she immediately ran off with the Squeaky Barbell and started chomping it. The novelty wore off pretty quickly though, and she hasn't touched it since that first week. It's just...kind of a weird toy. I don't like throwing it because it's so heavy and clunky. Ours is supposed to be a medium size, but overall it seems a bit small even for 28 lb Sisci. Pros: Durable. 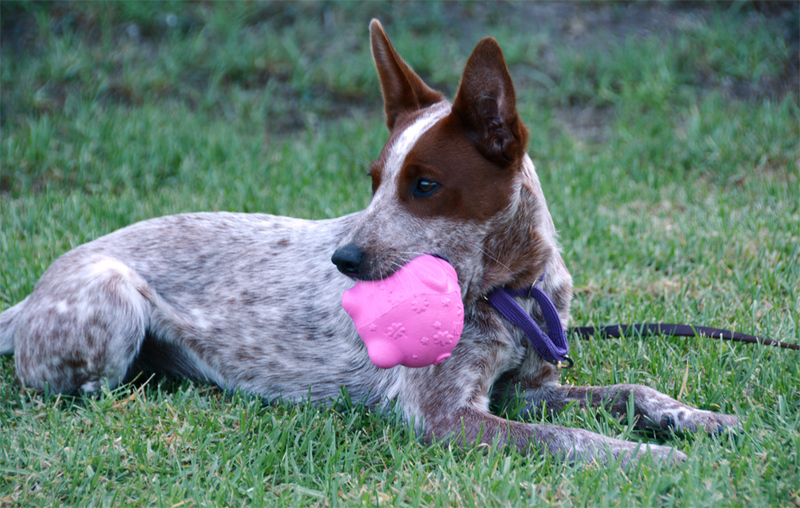 Several people have reported that this is the only squeaky thing their dog hasn't demolished in minutes. Affordable, so giving it a try is not a huge investment. 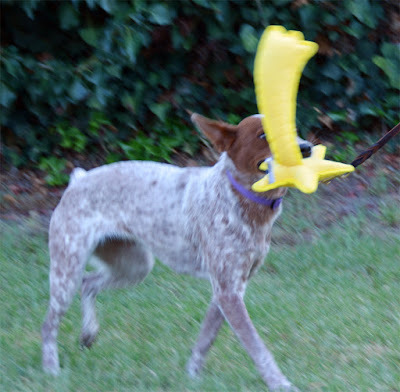 Cons: It's hard plastic and a serious chewer is going to gnaw it into sharp bits eventually. Too heavy for throwing. Bottom Line: The relatively small price tag makes it worth trying if your power chewer shreds everything else. This might be the one thing that holds up, and either way you're only out ~$10. These Real Meat Jerky Treats are the original product made by the folks at the Real Meat Company. These are slightly greasy, fairly stinky treats that are great for training. I do have to break them up into much smaller pieces, but they are wonderful for dogs with allergies and food sensitivities. When I first saw Real Meat Dog Food on the shelf at a local store, my first thought was "So they've put the jerky treats in a bigger bag, then?" The dog food itself seemed a bit drier than I remembered the treats being, but I didn't have the chance to do a side-by-side comparison until now. While they're both supposed to just be dried meat, the treats and dog food are actually pretty easy to tell apart. The Real Meat Lamb Jerky Treats are softer and greasier than the Real Meat Lamb Dog Food. The are easy to bend and tear into smaller bits for training treats, and are stinkier than the dog food. Real Meat Air-Dried Dog Food is harder and stiffer, so it's more difficult to break into tiny training treats. It's a more pleasant product to handle because it is less greasy and stinky, but that also makes it a lower value treat. The ingredients for the lamb treats are significantly less complex than those for the dog food. Treats don't have to meet nutritional requirements. The five ingredients in Real Meat Lamb Jerky Treats are: lamb, dried chicory root, vegetable glycerin, sea salt, and mixed tocopherols. These make for a shelf-stable product. By contrast, the dog food includes organ meats, ground bone, pumpkin, parsley, rosemary, and all the vitamins a dog needs. It has both a higher protein content and a higher fat content than the jerky treats. So is it worth buying the treats when you can buy a whole bag of dog food instead? Probably for some people. My dogs will happily work for the Real Meat Jerky Treats, but are pretty 'meh' about working for the actual food. What is a cost-effective, affordable alternative to Beneful? I feed my dogs all sorts of amazing top-quality foods, but this isn't feasible for everybody. The fact is, the vast majority of the general public has no idea what makes a good dog food, and there's a whole ton of fear-mongering on every level. It's tough to sort things out. Purina spends a crazy amount of money on marketing. They produce attention-grabbing commercials and beautiful packaging that very deliberately conveys the message that Beneful is healthy. The products themselves have names like "Healthy Weight" and "Healthy Smile". The constant message of health and wellness sticks with people on a subconscious as well as conscious level, Purina has done an amazing job associating Beneful with "healthy". This is why tons and tons and tons of people truly think that Beneful is a really healthy food for their dog. I've come to accept that most people don't live in the dog world the way I do. Most people buy their dog food at the grocery store, and need never set foot in a pet store at all. These people are probably unaware of the vast majority of dog foods on the market. They see the dozen or so brands at the grocery store, and of those Beneful is the one with the best marketing. People don't just think Beneful is great because they are ignorant, and I feel it is very important to acknowledge the role of marketing in this perception. So Why is Beneful So Bad? Class action lawsuit notwithstanding, Beneful isn't particularly worse than most of the other foods at the grocery store. The issue with these foods is that they tend to be made out of by-products from other industries. Most people can imagine what meat by-products consist of without going into disgusting detail, so unless they ask why by-products are so bad I can leave it at that. The first two ingredients in Beneful Originals chicken kibble are ground yellow corn and chicken by-product meal. One of the people in our Facebook conversation said they feed their dogs Pedigree as an alternative. The first two ingredients in Pedigree Adult chicken kibble are ground whole grain corn, followed by meat and bone meal. That's actually worse than Beneful, in my lofty opinion. Neither of these foods rate well in the dog world, Dog Food Advisor gives Beneful and Pedigree both its lowest rating of one out of five stars. What is a Cheap and Good Dog Food? There are tons of dog foods out there that are way better than Beneful or Pedigree. I feel it's important to recommend foods that are in the same price range if I want people to truly consider alternatives. Walmart sells a 30lb bag of Beneful for about $30, that's about a dollar a pound. The place I work sells a 33lb bag of Fromm Classics Adult dog food for $33, that's a dollar a pound for a 3.5 star dog food with no by-products, made by a very highly-regarded company that has never had a recall. It's the best value I am currently aware of, though one must go to a feed store or other specialty store in order to find it. Fromm Classics also has more calories per cup than Beneful, so less of it can be fed for a better value. Rachael Ray Nutrish is also around $1 per pound, and while it only rates 2.5 stars on Dog Food Advisor, it doesn't contain by-products and is widely available. For other options, I generally recommend people start by reading labels. By-products are undesirable because they can contain questionable substances from questionable sources. Named meats and meat meals are important. Chicken meal is better than chicken by-product meal, which is better than meat meal. Unintuitively, chicken meal is better than just plain chicken, since it is a more concentrated form of protein, and more of it makes it into the finished product. If people genuinely want to know more, I like to recommend the book Dog Food Logic, particularly for things like industry definitions of ingredients since these don't always match the layperson definitions. And that's really it. I want people to know that there is better dog food out there, and affordable alternatives exist. There is no need for fear-mongering, scare tactics, or tales of woe. Gory details and hyperbole are out, well-cited and reliable sources of information are in. 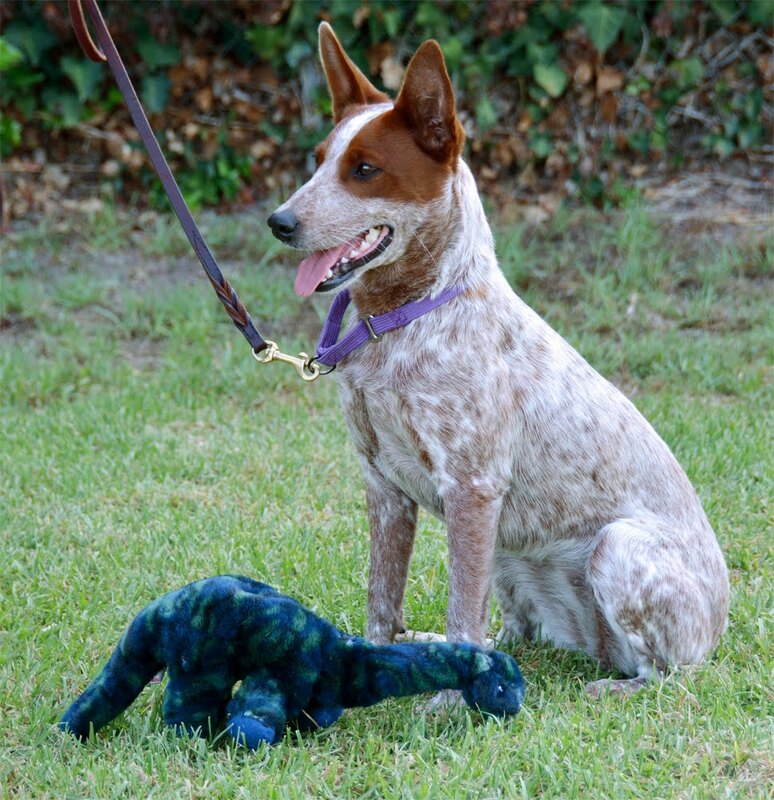 This Coleman brontosaurus is one of our many dinosaur stuffies. It is a nice dark, slightly mottled color that stays clean-looking. The body is pleasantly floppy, and it crinkles just a little. 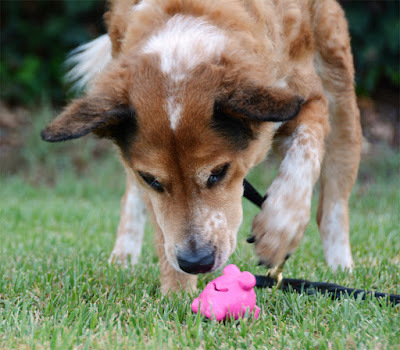 According to Coleman's website, the dog toys under their brand are actually made by Unique Petz. This company has a very flashy animated website with very little actual content. They state that they manufacture products under several brands, but only show the brand logos and no actual products. I'm pretty sure Coleman-brand dog toys are not currently being produced. Unfortunately, Brisbane and Ru are not crinkle toy fans. I kept the brontosaurus around anyway because I love it, and now Sisci thinks it's pretty awesome. Pros: Lovely dark textured color hides dirt so it always looks clean and pretty. Floppy soft body is a lot of fun to bite. Cons: The brontosaurus is looking a tiny bit threadbare in places despite it's relatively easy life at the bottom of the toybox. I can't remember if it came like that or if it happened in the wash.
Bottom Line: I think this is our cutest dinosaur stuffy. I am pleased to have it laying around the house. The video is from Ru's second time working with the sheep that day. The first time around he was a bit cautious until he realized he could make them move. Nothing makes him feel like a big dog like bossing around several creatures much larger than himself. He not only had a blast chasing them around, he also maintained his interest for much longer than I expected. Frankly I was surprised he wanted to play at all, but our instructor says she has yet to see a chihuahua that doesn't want to work sheep. I guess they just don't usually get the chance. What is the most unlikely breed/task combination you've seen so far? I picked up this sample of Artemis OsoPure Salmon and Garbanzo Bean Formula kibble at the little feed store around the corner from my house. I had been aware of the Artemis brand of food since around 2010, but at the time the only product line available in my area was their Fresh Mix line. Those are all chicken-based, so I had mentally filed Artemis under "nifty foods my dog can't eat". I was pleased to find that they had extended their product range and that three of the foods in their OsoPure line were egg-free and poultry-free. After I picked up this sample, but before I used it, I got back the results of Brisbane's major allergy test. He is allergic to sweet potatoes, among other things. The vast majority of grain-free dog food contains sweet potatoes, including all of the Artemis OsoPure kibbles. Oh well. Fortunately I have Sisci to sample the many non-Briz-safe foods we encounter. 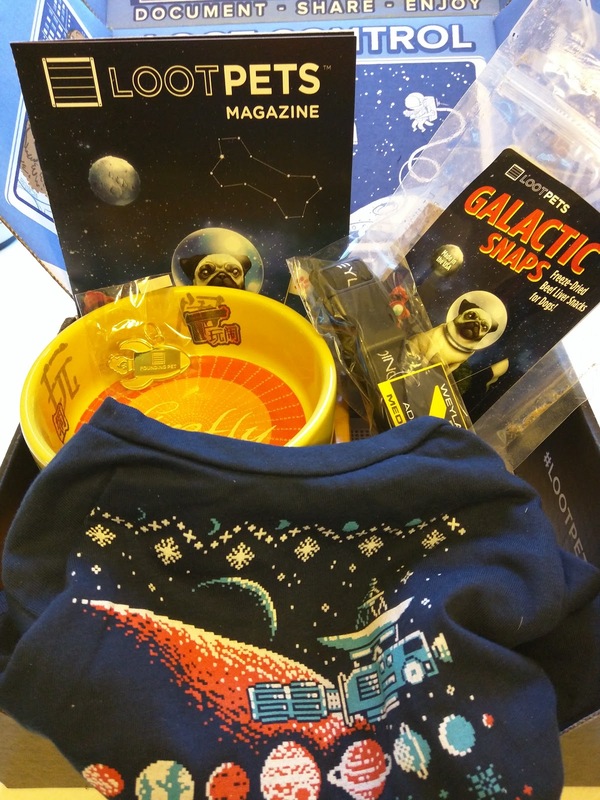 The Artemis company was founded in 1998 in Carson, California, so they are at least local to my state. This is basically a marketing company, as their food is actually produced by Diamond Pet Foods. Diamond makes a ton of foods, including Wellness, Solid Gold, Natural Balance, Taste of the Wild, and Canidae. The Diamond pet food plant has been involved in at least one major recall that spanned multiple brands, so these are not my preferred brands of food. As grain-free dog foods go, this one is merely ok. It Is made from salmon meal, followed by garbanzo beans, sweet potatoes, regular potatoes, and peas. That's a lot of carb sources, so many that Dog Food Advisor only rates it 3.5 out of 5 stars. Sisci isn't food-crazy or indestructible like Brisbane, but she ate it willingly and the sample didn't upset her stomach at all. This is not a food I would choose to feed my dogs long-term, and probably not something I would include in their regular rotation because there are a lot of better options available. Still, it's better than pretty much anything I can find at the grocery store and definitely not something I would feel bad about feeding if it was the best option available. 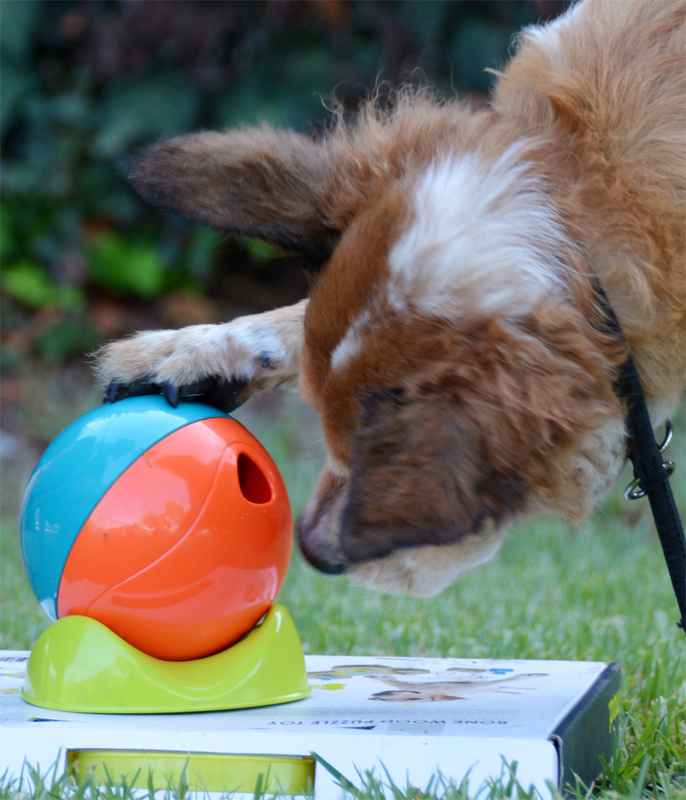 The Outward Hound Whirli Treat is a poorly designed puzzle toy that consists of a ball with holes in it, and a stand. Theoretically the stand holds the ball so that it can roll in place, making the puzzle slightly more difficult to solve. In reality the ball falls off the stand the moment anyone touches it or breathes near it. It's really quite difficult to get it to spin on the stand without knocking it off, and the dogs don't seem to realize that this is how it's supposed to work. There are two large holes in the ball, and nothing else to keep the food from pouring out immediately. 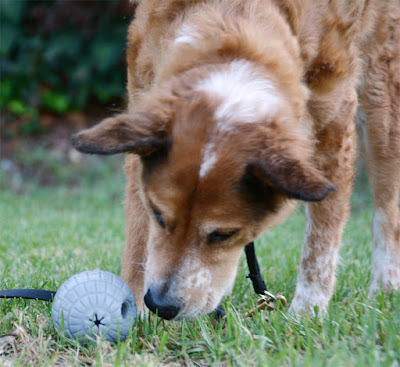 Seriously, I doubt the designers of this toy ever actually tested it with a real live dog. This is supposed to be a level 2 difficulty puzzle, and like the Tic Tac Twirl it is another that ejects all the food immediately when nudged. I can fit at least a cup of food in here, and it will take slightly longer to empty than a bowl. A soda funnel works pretty well. There is literally nothing stopping the kibble from just pouring out. Even Ru can't use this thing without knocking it off the stand, so I have no idea what size dog it is supposed to be for. The two parts separate instantly when touched. Maybe the rest will stay together. I have to say that the Kyjen toys we have seem very sturdy while the Outward Hound-branded ones are much more glossy and flimsy. I don't like the new color scheme, either. It's a hard plastic ball, rolling unfettered across my hardwood floors. The only saving grace is that the dogs empty it instantly and then ignore it. It's a hard plastic ball rolling unfettered across...well, you get it. The ball doesn't open up, but the holes are big enough to stick a bottle brush through. Rolling the ball on the stand is difficult, I can't imagine any kind of animal that would attempt to use this toy as intended rather than letting it roll off the stand and dump food everywhere. This Kong Tuff N' Lite Pig is definitely one of Sisci's new favorite toys. 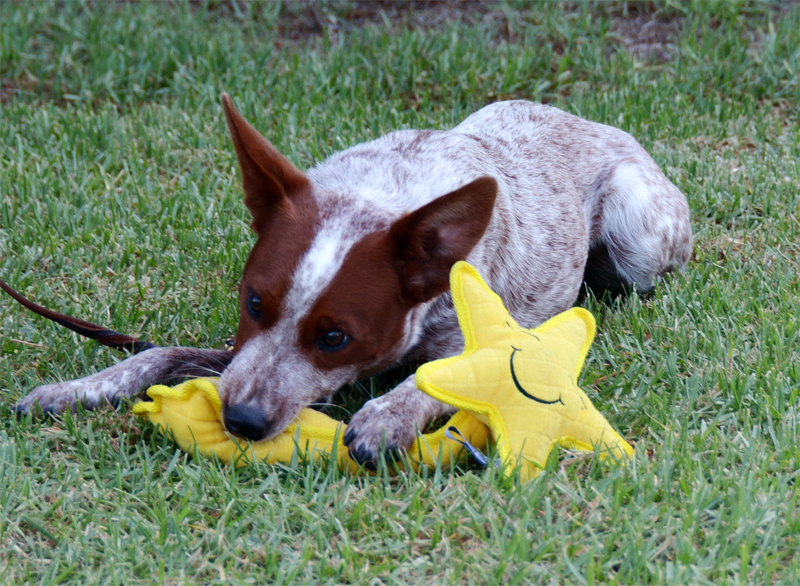 It's durable enough for tons of biting and squeaking fun, but weighs almost nothing. This toy is marketed for power chewers, is light enough to be tosses around indoors, and floats. We have a pink pig, there is also a blue octopus and a green frog available. As advertised, this toy is incredibly lightweight and bounces harmlessly off most indoor surfaces. We don't really have winter here in California, but I'm sure it would be great for indoor playtime when it's seriously cold outside. Ours spends a lot of time laying around the yard. We haven't yet tested the seaworthiness of the pink pig, but I would be shocked if something this lightweight could possibly sink. I've heard that they can take on a bit of water, though. 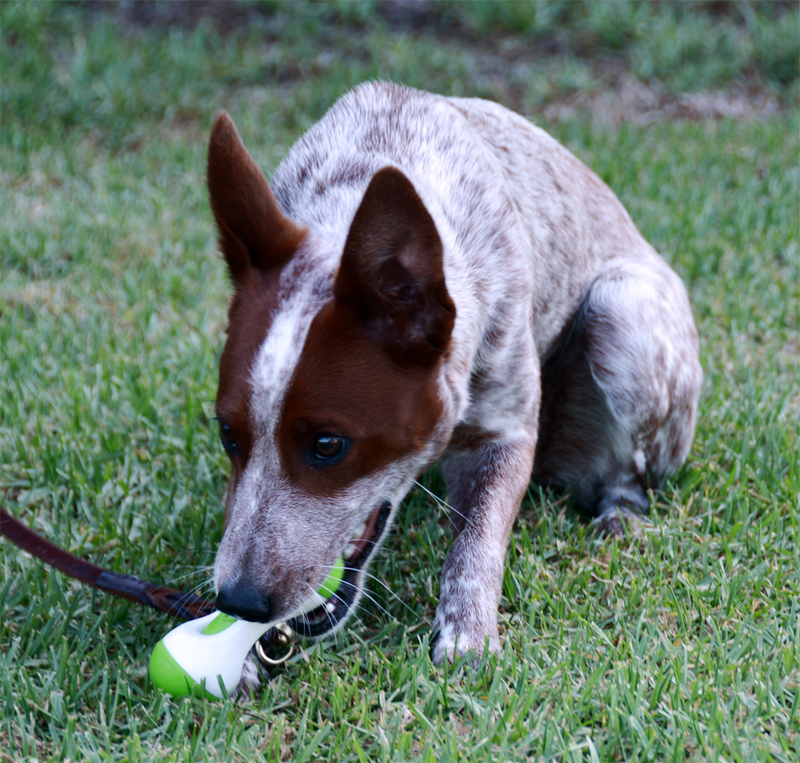 While this is advertised as being for power chewers, it isn't really a chew toy. 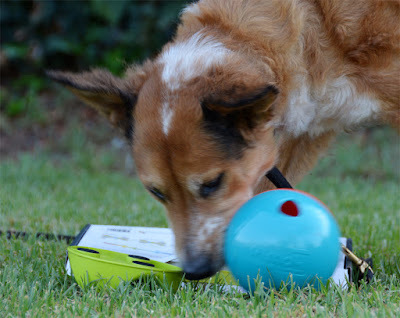 The Kong Tuff N' Lite products are definitely for supervised, interactive play. They are, however, more durable than the average "indoor" dog toys. They are also lighter than the usual 2 lb. hunk of rubber toys for serious chewers. 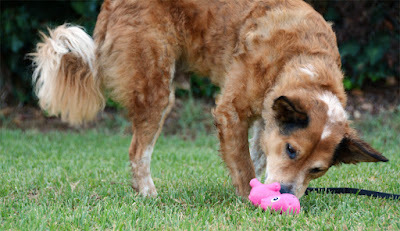 Sisci loves to bite her pink pig. She insists on carrying a toy in her mouth every time she goes outside (but not when she comes back in) and the pig is the first thing she grabs if it isn't already laying out in the yard. Pros: Really, really lightweight, as advertised. Squeak is not annoyingly loud. 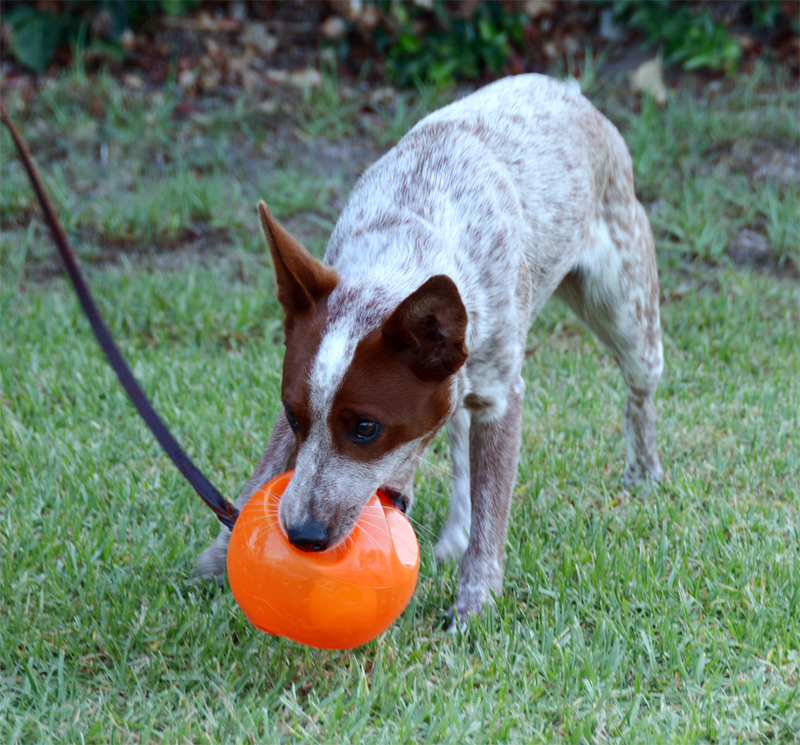 More durable than a tennis ball, and bigger than one so it's safer for larger dogs. Cons: After one day ours was full of punctures. It hasn't taken any further damage, but it's not exactly pretty now. Bottom Line: I'm kind of disappointed that Sisci hasn't torn it open yet, because I'd really like to see what's inside there. Maybe open-cell low-density foam? It doesn't feel empty. I ordered these Merrick Venison Holiday Stew Sausages from Chewy.com. These are soft, semi-moist little treat rolls. This venison recipe ismade from venison, beef, oatmeal, potato, apples, carrots, and peas. Perfect for Brisbane's poultry/egg/corn/barley/sweet potato allergies. Good For: Chopping into quarters lengthwise and then into tiny pieces for training treats. Hiding in puzzle toys. Keeping Brisbane's attention while I do his allergy shots. Not Good For: Feeding the dogs without getting my hands all yucky. How Much We Like Them: They're a nice bit of variety in Brisbane's ever-shrinking pool of treat possibilities.